Tambli / Tambuli is a classic Karnataka dish (more so in western / north western karnataka) and can be loosely called 'raitha' or 'pachadi'.. And I would term this is more like the Tamil dish "pacha mor" (made in Iyer / Iyengar households). But for me, its more than that,especially for those who swear by authentic Karnataka cuisine. Its a heady mixture of spices and is super healthy for the fact that its extremely cooling (esp for digestive disorders). While we didnt make this often at home, I remember having this first at a friend's housewarming when I was all of 8 / 9 years old, and that taste still lingers on. Food and memory seem to have an irrefutable connection with man and each one of us tries to recreate that food we tasted first in our own homes. 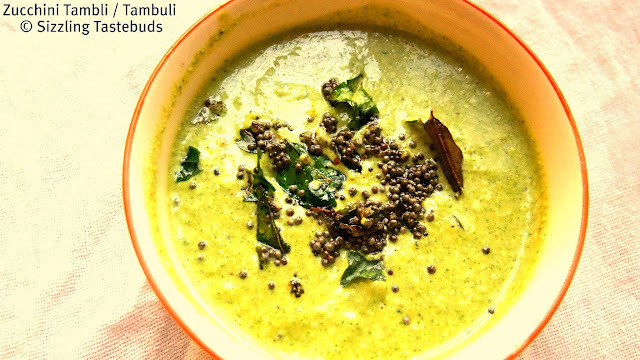 This dish - Zucchini Tambuli - is made from various plants / shoots and herbs and zucchini can easily be replaced by cucumber/ridge gourd/Dodda Patre (ova leaves)/ginger or even Mangalore Cucumber. Today, I tried this out with Zucchini and we loved it a lot (this came as close as it could to indianising Zucchini). 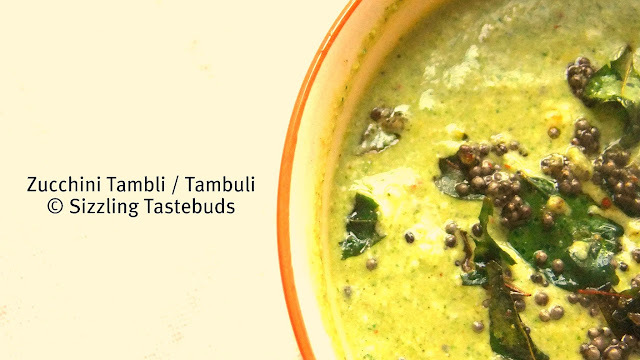 Best served with hot steaming rice and some pickle / dry curry, and it serves for a super filling & healthy meal. 3) Whisk the yoghurt with salt and sugar. Add this above paste to the curd / yoghurt and mix well. 4) Prepare the tempering with ghee, mustard seeds, hing and curry leaves. Add to the Tambli. that's very inviting one !! looks wonderful ! !